“Finally,” right? 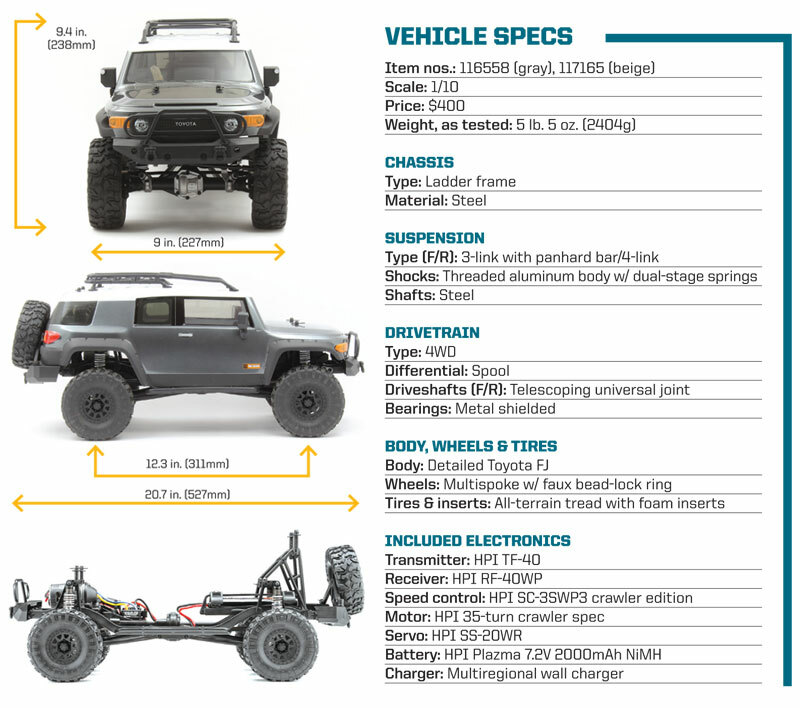 The Venture FJ took the long way to the trail, but now that HPI’s first-ever dedicated 4X4 trail-truck platform is officially released to the wild, it’s the rig everyone wants to see. 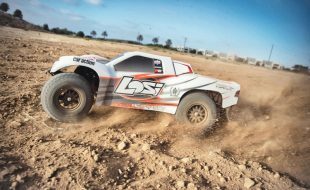 With a high bar set by the established Traxxas, Vaterra, RC4WD, and Axial models, the Venture needs to be a substantially well-engineered machine to compete—and it sure looks to be. 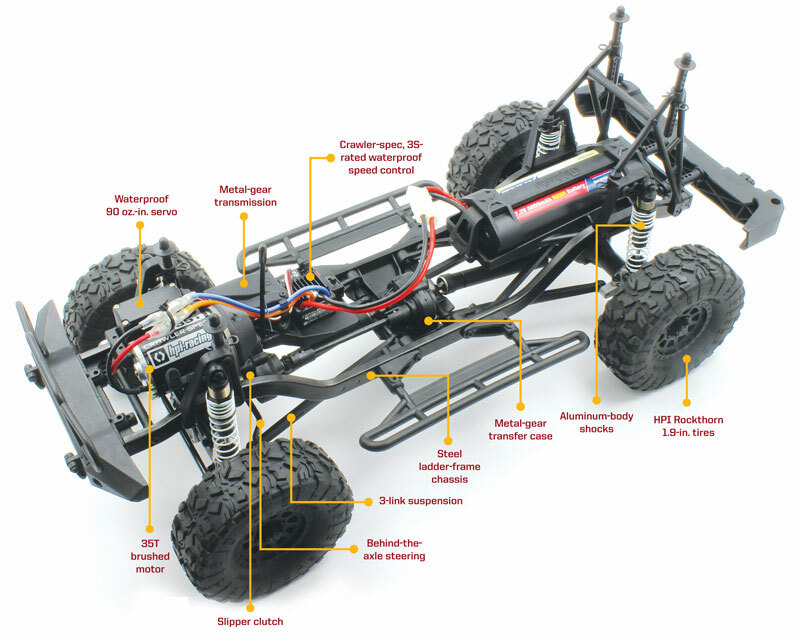 All the right features are in place, including an all-metal transmission and aluminum shocks, and attention was given to important performance factors such as weight distribution and approach/departure angles. 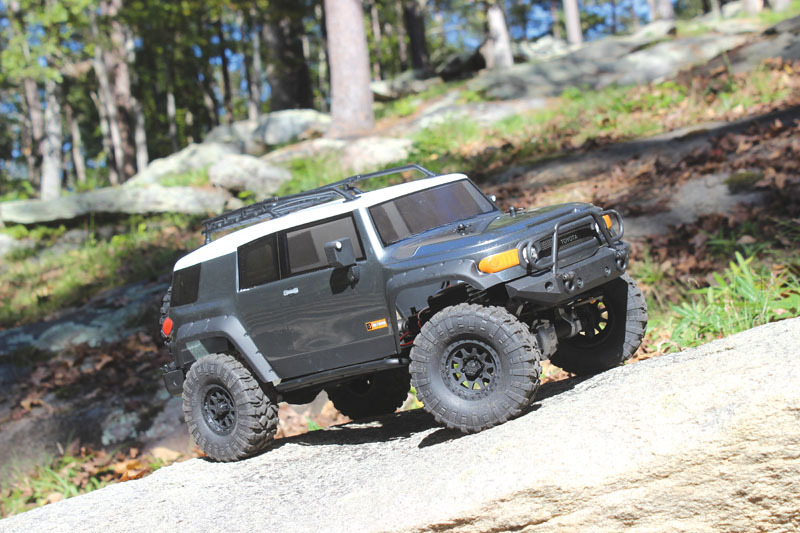 Add the nicely detailed Toyota FJ body and swing-away spare tire, and you’ve got another exciting ride at the trailhead—which is beginning to get a little crowded. 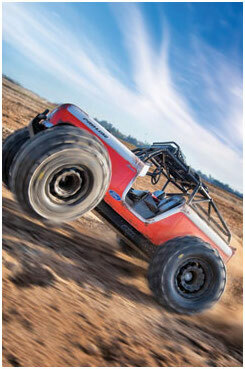 Does the Venture FJ set itself apart from the comp when the rubber hits the off-road? Let’s take a ride and find out. Like the other top trucks, the Venture gets a chassis-mounted servo and Panhard bar up front, with a pair of plastic lower links for a 3-link setup. The rear end gets the same plastic lower links and what looks like a pair of upper links in a “4-link” configuration, but the upper links are actually a single Y-shaped part that counts as a single link. 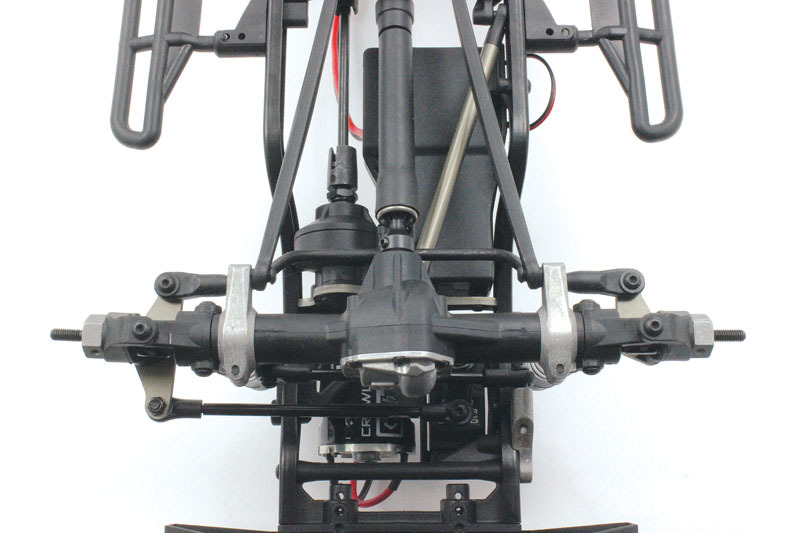 This design allows for a single pivot point at the chassis, which improves axle flex. You won’t find a plastic gear anywhere between the Venture’s motor and hubs. 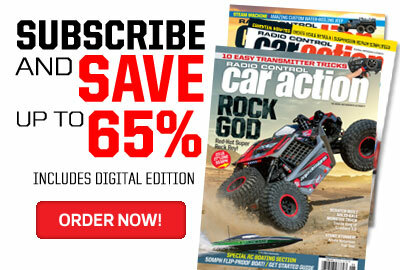 And in the case of the transmission, you’re getting Savage XS parts—so, yeah, tough stuff. The transmission stacks its gears vertically, which allows a dogbone to take a straight shot to the compact transfer case. 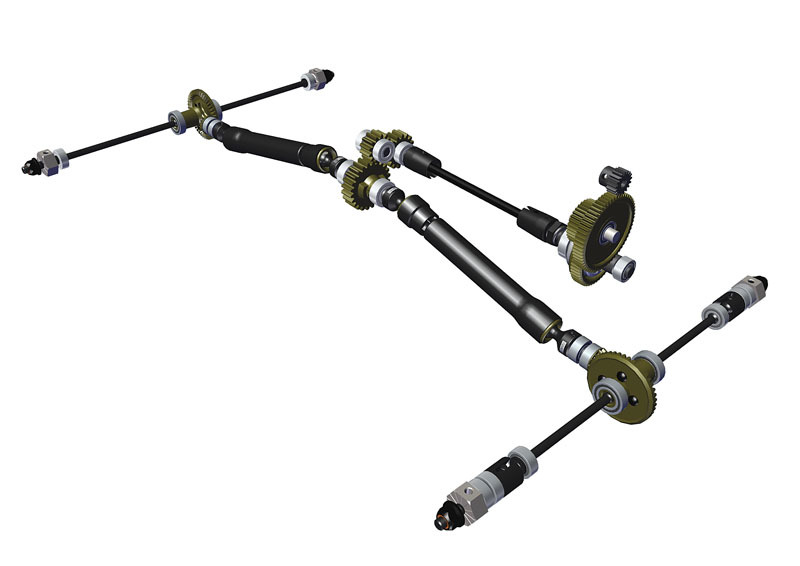 Fat, telescoping plastic shafts with CV-style joints make the trip to the axles, where the metal ring gears are attached to “spools” rather than differential cases with lockers inside. The drivetrain also gets a slipper clutch but not on the spur gear; it’s enclosed within the gearbox and adjusted via a nut behind the outdrive. If the Venture looks particularly clean from the front but you can’t put your finger on the reason why, it’s because of the steering linkages—they’re hidden. Where every other trail truck hangs its linkages in front of the axle, the Venture tucks them behind it. In addition to being shielded from view, they’re shielded from rocks. The steering bits offer plenty of throw, and despite have dogbones and drive cups instead of CV joints, the truck puts down power smoothly, even at full throw. Nothing out of the ordinary here—just tried-and-true shock design with dual caps on a threaded-aluminum body in a scalelike diameter. Each shock wears a pair of springs: one short and soft for small-bump compliance, and one longer and stiffer for big hits. A nice styling touch is that the upper caps thread into the body rather than over it, for a more realistic look. You gotta have a ladder chassis to compete in the 4X4 trail-truck segment, and the Venture’s C-channel steel rails are good-looking parts. Their rail spacing is wide in the center and narrows at the bumpers (when viewed from above), and the chassis can accommodate wheelbase settings from 11.4 to 12.2 inches. 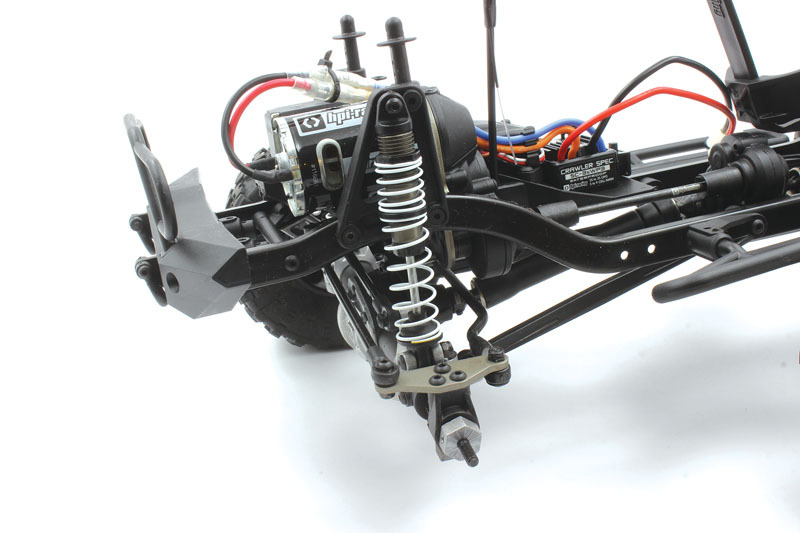 HPI also took pains to make the Venture easy to work on; remove just five screws and disconnect the steering link and all the electronics can be removed as a unit along with the motor and transmission. I’m glad to see the nicer TF-40 radio included with Venture instead of HPI’s hatched-shaped TF-11. In addition to looking nicer, the TF-40 has a foam-gripped, drop-wheel configuration, and adjustable endpoints on both channels. The radio is matched up with a RF-40WP receiver that is waterproof by itself without need for an enclosure—but the Venture has one anyway, which is redundant but nice if you swap out the radio gear and have a nonwaterproof receiver. 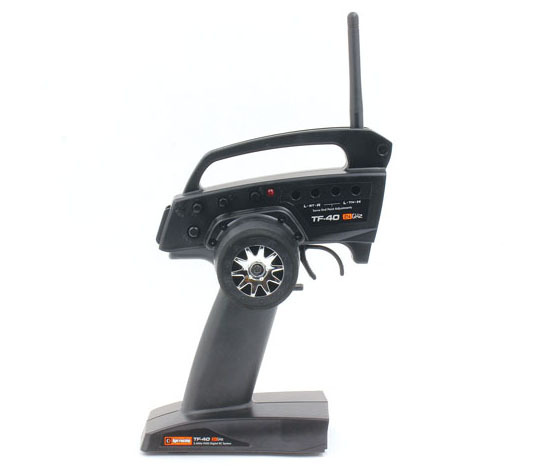 The Venture’s SS-20WR servo is also waterproof and sufficiently powerful with 90 oz.-in. of torque. 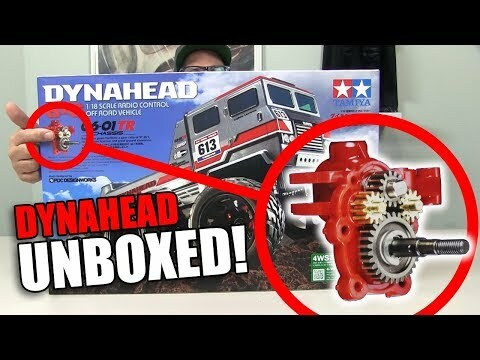 My HPI Venture FJ came with a plastic-gear servo, but according to HPI, it will be upgraded to a metal-gear unit. 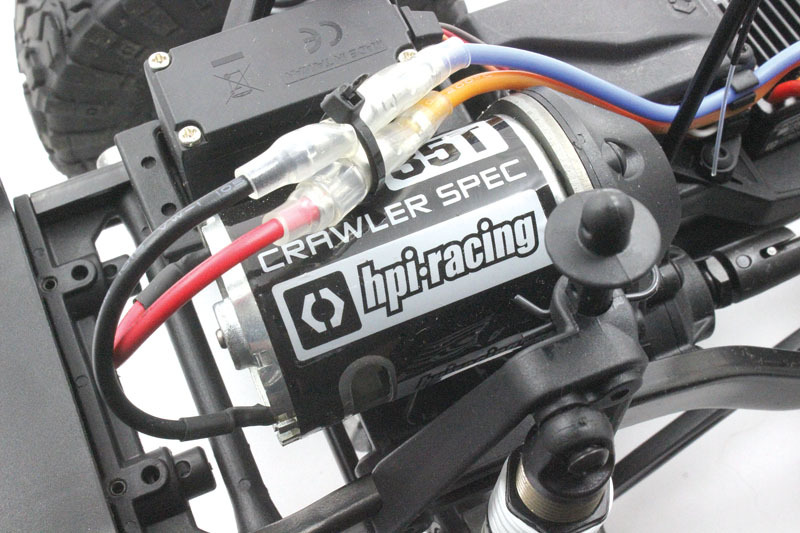 The Venture gets a new power system with a “crawler edition” waterproof speed control. Like some other models we’ve seen, it uses jumper plugs to set the drive and battery modes. But instead of just two “crawl” and “normal” drive modes, HPI uses the functionality to provide zero, 80%, and 100% drag-brake settings. Nice touch. Battery modes are NiMH and LiPo, of course, and you can run 2S and 3S packs in the Venture. 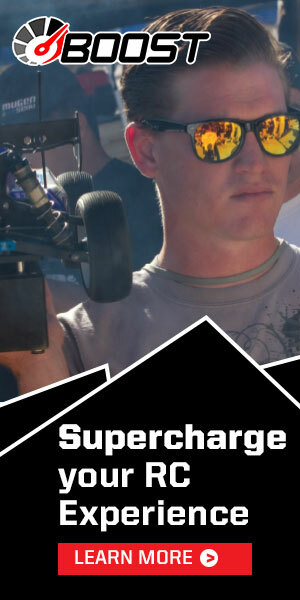 The volts spin a 35-turn “Crawler Spec” sealed endbell motor. The Venture rolled up to the 9.5-inch mark, for an RTI score of 772. And the flex-factor? 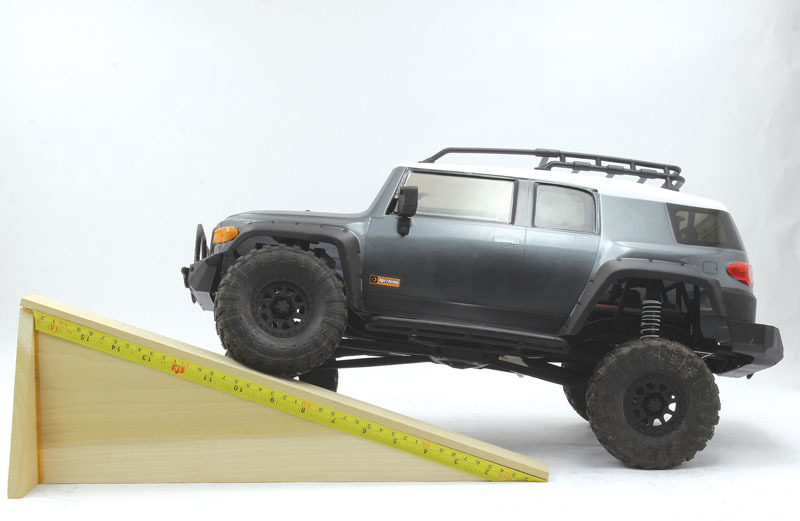 Using our 20-degree articulation ramp and the standard Ramp Travel Index formula, the Venture posted 772, which is about average for trail trucks. How did the Venture FJ come to be? 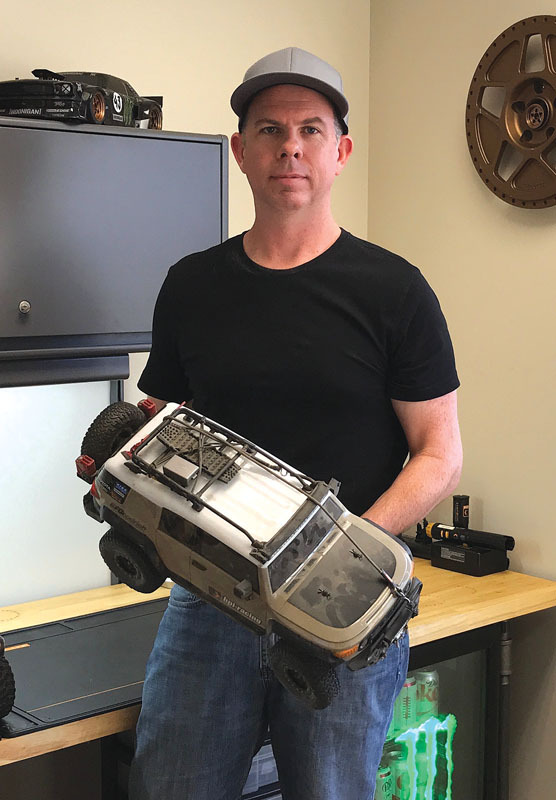 For an inside look at the journey from “new folder” to completed truck, we spoke to HPI’s Senior Product Designer Thad Garner. 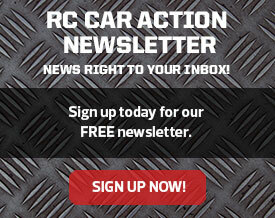 RC Car Action: The trail-truck scene already had established heavy hitters before the Venture debuted. Where did you see opportunity for HPI to do something different and/or better? 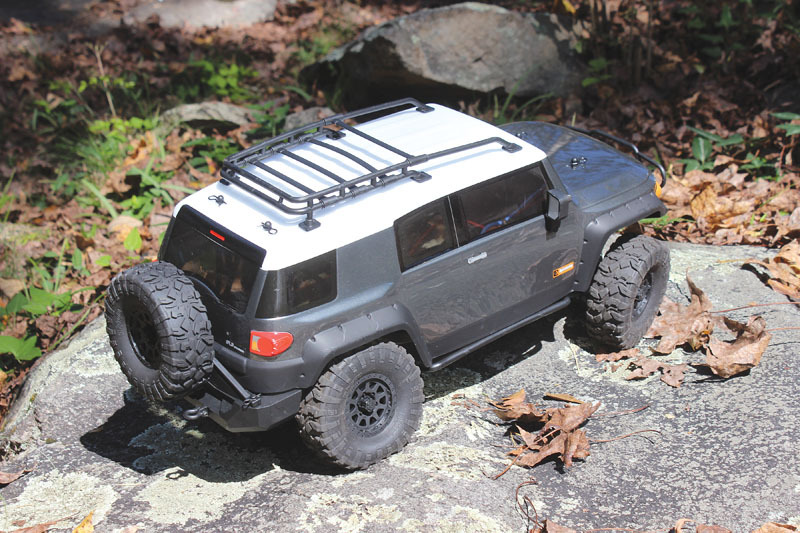 Thad Garner: A lot has changed in the crawling segment since the original design of the Venture began; however, the Venture still holds its own in the category. My original idea was to give the customer everything they need and nothing they don’t by eliminating cost-adding gimmicks and features that inevitably get deleted by the customer to improve reliability. 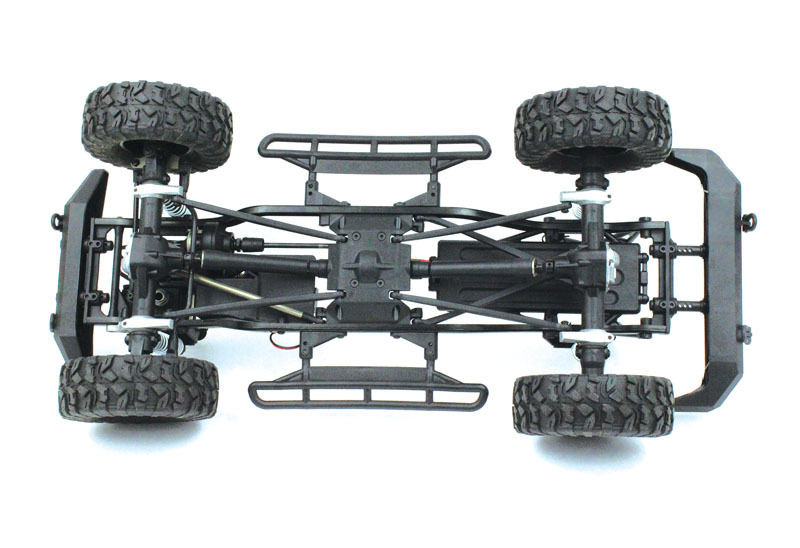 I created a chassis that is straightforward, reliable, easy to work on, and a great base for customization. What features were considered must-haves? There were quite a few objectives for the Venture. 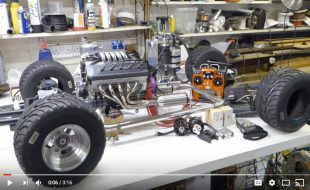 Drivetrain priorities included keeping the motor and gearbox mounted as far forward and low in the chassis as possible and keeping the transfer case compact. I also spent a lot of time on the steering system to incorporate a chassis-mounted servo and behind-the-axle [steering]. What’s your favorite part of the Venture’s design? If I had to pick one, it would be the behind-the-axle steering. After competing in the Recon G6 Fix Enduro recently, I must say I really enjoyed not using my steering link as a bumper. My servo also thanked me. 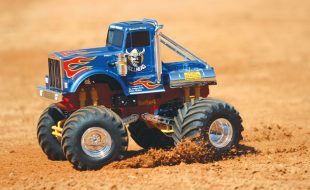 The truck debuted as an RTR. Will we see a kit or roller? We are working on a kit version. It will be a true scale builders’ kit, eliminating equipment and parts that most serious scalers might already have. 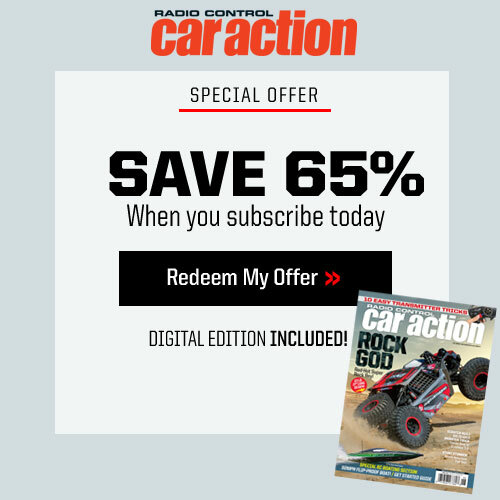 By eliminating the body, wheels, tires, and electronics, you’re left with the perfect low-cost, fully customizable clean slate to build the Venture into your very own scale creation. Nice! Any future body styles you can tell us about or hint at? We have a few in the works. I will say one might require a longer chassis. 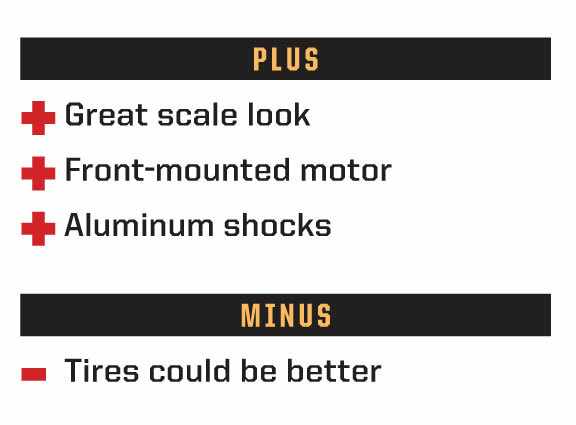 Automotive design in any scale is all about compromises—you can’t design for the most X without having less Y. What were some of the tougher calls to make in designing the Venture? Fortunately, the compromises were cost-saving compromises with little to no effect on performance or durability. Here’s an example: I would’ve liked metal lower links but would rather have the all-metal gears. Links are easily upgradable by the customer, and the plastic links are virtually indestructible. If the compromise was to have a few plastic gears but metal links, then I would be compromising durability and asking the customer to later buy costly metal gears. It’s about working within a price [constraint] and providing the best value and spec for that price. 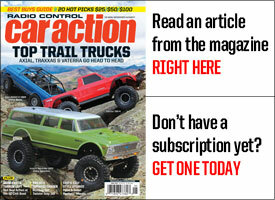 In what direction do you see the trail-truck segment going? I see it getting even more scale—body detail especially. Great stuff, Thad. Thanks for your time. Nice job on the Venture FJ. I took the HPI Venture FJ to my favorite trail spot, which has just about every surface that a trail truck could see in its lifetime. The truck seemed low on steering throw, but I noticed the radio’s steering rate knob wasn’t max’d out–FYI when unboxing your Venture. As I headed down the trail, I was happy with the truck’s top speed of 4mph; it matched my walking speed, which meant that I didn’t have to slow the truck down or speed myself up. The throttle is smooth, a must when attacking technical sections on the trail. Out of the box, I found the drag-brake setting to be a little too light for my liking; it allowed the truck to slightly roll down inclines. I parked the FJ and pulled the body off so that I could access the drag-brake tab on the speed control and moved it to the 100% slot. With the new setting, the drag brake did its job and held the FJ in place no matter how steep the incline was. The tires worked well on the dirt and on high-grip rocks, but they struggled a bit on smoother rocks. The firm-compound rubber made the tires slide and weren’t able to pull the truck up, but in some spots, I was able back up and get a run at it and make it up and over most of the smooth rocks that I encountered. The body has nice details that enhance its scale realism, and HPI did a good job of keeping it lightweight. In the end, that allowed the FJ to sidehill pretty well; it was able to run it at an angle that would have caused other trail trucks to tip. The chassis is well balanced, which is good for a lot of spots on the trail, but the front end lightened up and caused the FJ to tip when attacking more aggressive angles. An area where some trail trucks struggle right out of the box is with their approach and departure angles, and the front and rear bumpers end up hanging up or hitting when doing more aggressive crawling. HPI did a great job tucking in the front and rear bumpers along with the spare tire, and that allowed the FJ get up and over stuff that would stop other trail trucks in their tracks. I was concerned about the low-hanging clamp on suspension mounts on each end of the axles hitting obstacles while on the trail, but when I was driving the FJ, nothing stood out as far as the truck hanging up. At the end of the day, I inspected the mounts, and there weren’t any scratches or dings in them, which shows that they aren’t in the way.